Any advances made by Afghan women in politics, education and law in the last 10 years could be lost in a quick fix bargain for peace, Oxfam has warned. Afghan women could face a dangerous future after 2014 if they are sidelined in the search for peace, according to a new Oxfam report ‘A Place at the Table: Safeguarding women’s rights in Afghanistan’, co-authored with Afghan academic Orzala Ashraf Nemat. There has been criticism that governments did little to follow through claims that international military intervention that began in October 2001 would improve the lives of Afghan women. Ten years on, any advances that were made in areas such as political participation, the rule of law, and education have already begun to be eroded as security deteriorates across the country. Against a backdrop of increased insecurity and fighting, violence against women is on the rise and their rights are being eroded as leaders show a lack of political will to protect and promote them. New laws that criminalise practices such as honour killings, child marriages and giving away girls to settle disputes are only being enforced in 10 out Afghanistan’s 34 provinces. In the second quarter of 2011, 1,026 cases of violence against women were registered by the Afghan Independent Human Rights Commission, compared to 2,700 cases in the whole of 2010. There are 69 female MPs taking up 28 per cent of seats in the Afghan parliament, just over the 25 per cent guaranteed in a quota system put into place in 2005. The number of female ministers has fallen to one, compared to three in 2004 and the number of women in the civil service dropped from 31 per cent in 2006 to 18.5 per cent in 2010. Women are also being sidelined in the reintegration and reconciliation process, the report says. Oxfam has urged world leaders to ensure any peace includes benchmarks to guarantee women’s rights, such as monitoring the numbers of girls in school and the numbers of women in public life. It also called on the Afghan government and international community to ensure the full participation of women in all peace processes and the matching of the government’s existing pledge of 30 per cent of women in government bodies, as well as continued funding for services that support women, such as schools and leadership programmes as well as access to basic services, beyond 2014. 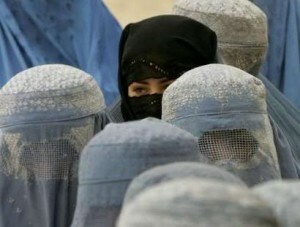 Nemat said: “Recent history has been harsh to Afghan women – and we don’t want to see it repeated. We have made incredible gains in the last 10 years. Women are working as doctors, lawyers and businesswomen; and girls are at school.